Central Florida Reception Center is located in Orange County Orlando Florida. It is a level VI facility that houses male adult and young adult offenders. The custody levels housed at this institution are minimum, medium and closed custody inmates. Currently this facility has approximately 1,670 offenders. As a reception center this facility is responsible for the intake and classification of many of the inmates in the region. Drug screening, mental health, and physical wellness are all checked during reception. 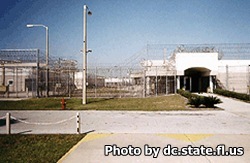 Because this is an intake facility where inmates are usually only housed temporarily, inmates who first arrive at this facility are unable to immediately make phone calls, and no vocational and educational programs exist. To be eligible to visit an inmate you must first fill out a visitors application and have it approved, this is a process that can take up to thirty days. The visiting hours for Central Florida Reception Center are Saturdays and Sundays from 9am-3pm. You may drive onto the prison grounds no earlier than 7:30am, registration for visiting starts at 8:15am and ends at 2pm, so if you arrive after 2pm you will not be able to visit.